PMS (premenstrual syndrome) is a notoriously common problem. The condition occurs due to (drastic) hormonal changes during menstrual periods, which cause the majority of symptoms, including dizziness. It is important to distinguish between normal and abnormal menstruation. In the former case, everything goes in a natural way. In the latter case, this is not natural or seasonal: it is a manifestation of systemic diseases and disorders. It is imperative that you treat these conditions instead of expecting them to end by themselves. Premenstrual syndrome causes a whole bunch of hormonal, cardiovascular and other types of symptoms, which signal a general hormonal shift. The second phase of the cycle is characterized by increased progesterone. Actually, this is the body’s reaction to ovulation and, consequently, a possible conception, as it prepares itself for pregnancy. If there is no conception, hormone levels drop. It is the drop and physiological changes caused by it that trigger what we know as premenstrual syndrome. Low progesterone results in low vascular elasticity and slows down their response to changes in air pressure. This causes hypertension in women. 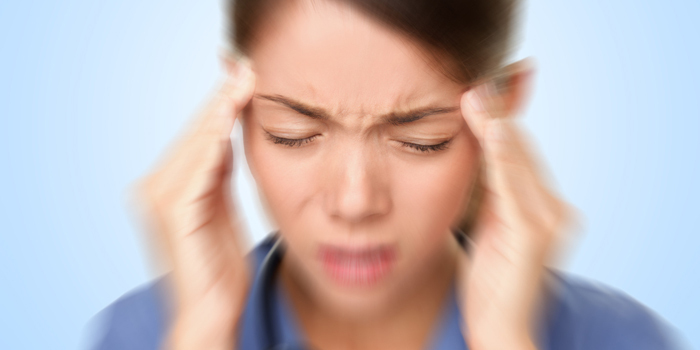 In turn, hypertension causes dizziness and headache. Injuries (cranial) and other factors. Do not lift weight that is heavier than 5 kg. Doing these simple steps will help you at least significantly reduce the symptoms, even if you have abnormal PMS. If these steps do not work, you may be dealing with a kind of problem, which requires a trained endocrinologist’s advice.